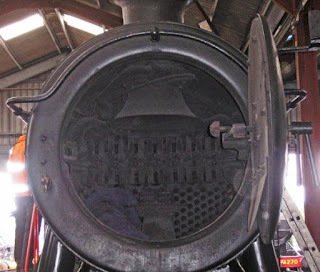 David Moore and Andy Bryne identified the location of the photo (see previous post) as Severn Tunnel Junction shed. Tues 3: Hot exam (external examiner, 9.30 am) - Roger light fire, etc. Sat 7: Drain ready for transport to Llangollen. Much assistance from Loco Dept chaps: Much gratitude & thanks to JC, John H, Tim P, Ian G, Richard, Martin, Mike (and apologies to anyone whom I’ve missed off). 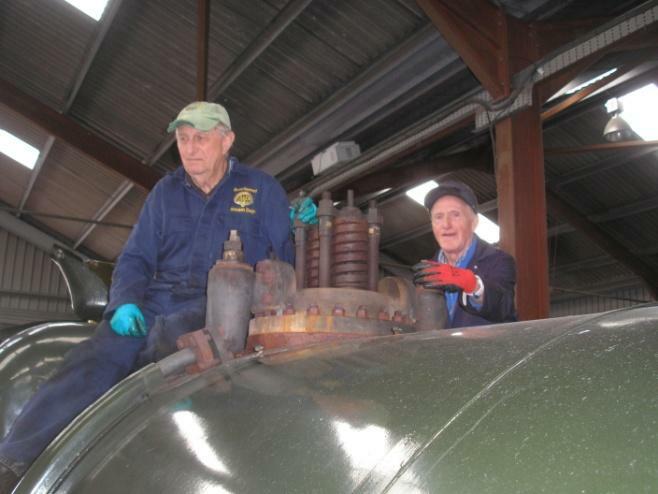 Bruce & Dixie worked on removing the brass bonnet, safety valves and clack valves. 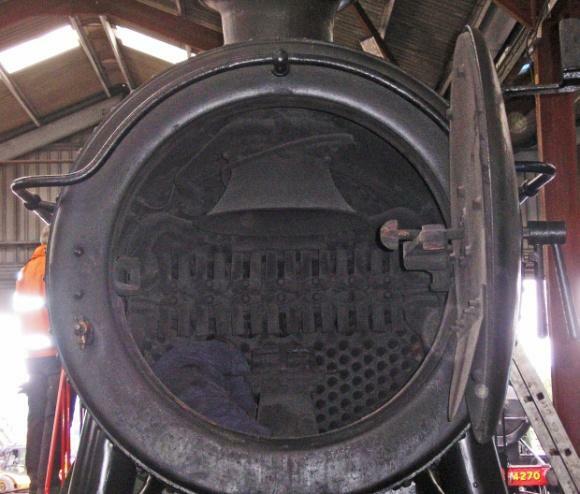 Bruce later lapped the safety valves in and replaced the bonnet. 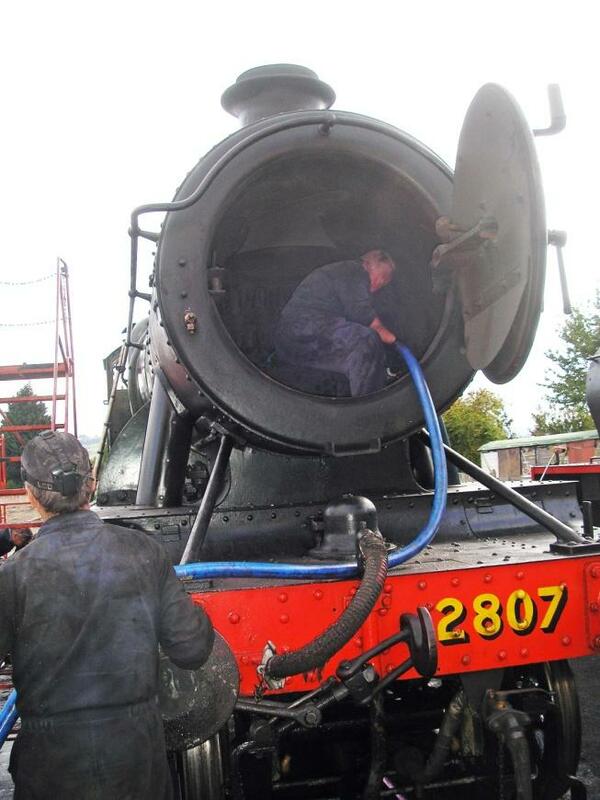 Loco Dept chaps were removing mud-hole doors and wash-out plugs. John G and Ian G were cleaning all the plugs up. I cleaned the mud-hole doors. John also checked the threads on them and made sure they were pukka. 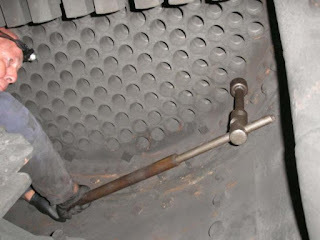 Gilbert removed the last mud-hole door (under the cab floor) after assisting with the removal of the gauge frame and the wash-out plugs in the firebox backhead. In spare moments, John G managed to wire-brush and paint two chair tops & one bottom. I finished two boot scrapers and then restocked both the Flag & Whistle and the Coffee Pot cafés. Yes - Martin removing wash-out plugs! It rained, so I popped down and painted some chairs because there are no completed boot scrapers. 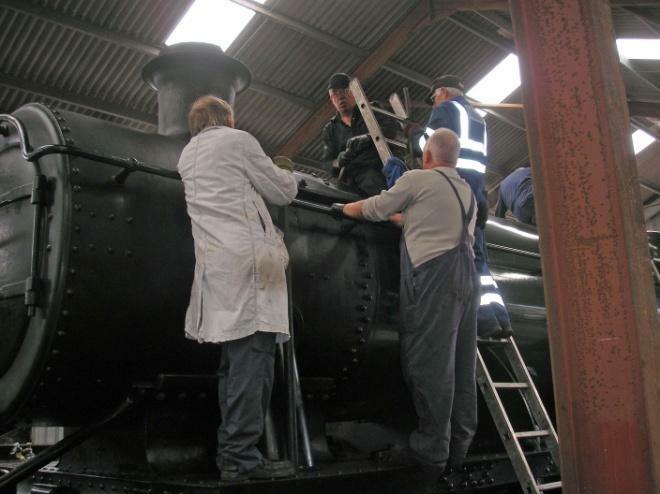 Being Thomas Weekend, it is not likely that the cafés will sell out, but …! Mon 9: Transported to Llangollen. Bruce reports: “Only three of us today, in fact the whole department was quiet, probably the Thomas effect. 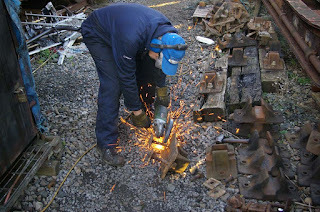 David had brought the new grinding wheels for the bench grinder which he duly fitted. He also brought the laser cut parts for the tender guard irons, these to be finished later ready for fitting during the winter maintenance period. Gilbert and David then removed the handles on the Blower and the Ejector Valves, which had been reported as leaking, and replaced the gland packing. I, meanwhile, spent some time in my favourite place, on top of the boiler, cleaning the safety valve and clack housings ready for reassembly on Wednesday. I also gathered all of the top Clack Valve parts together to take home and machine/refurbish them there. 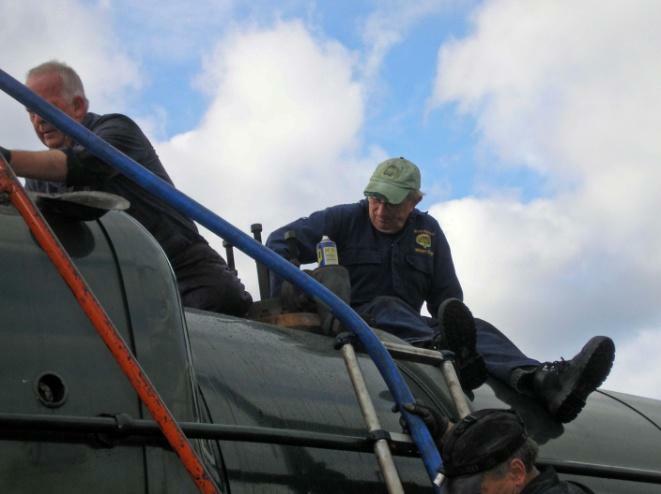 We had suspected that the fireman's side injector steam valve had been leaking so Gilbert and David, assisted by Stuart [Loco Dept. ], removed the cover to investigate. 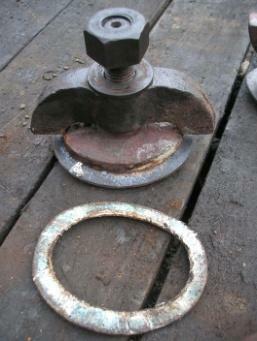 Sure enough the seat was pitted so we decided to re-cut the seat and, while it was apart, replace the gland packing. We noticed that the grate was still in place so Stuart removed several fire bars on each side so that the boiler inspector can examine the nuts around the bottom of the firebox."